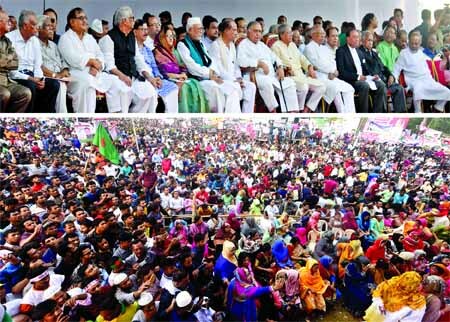 Jatiya Oikyafront organised a mammoth meeting at city's Suhrawardy Udyan on Tuesday to realise their seven-point demands. Among other leaders, Jatiya Oikyafront Convener Dr Kamal Hossain took part in the programme. Leaders of Jatiya Oikyafront on Tuesday asked Awami League led 14-party alliance government to dissolve the parliament and form polls time neutral government to hold a participatory and inclusive national election for the greater benefits of the country. They threatened that if the election schedule was not delayed and the seven-point demand not fulfilled, the Oikyafront would start long march from Dhaka to Rajshahi on November 8 and hold a public rally there the next day. Then the front will also organize rallies in Khulna, Barishal and Mymensingh. Addressing a rally as the chief guest at Suhrawardy Udyan in the capital, top leader of Oikyafront and Gono Forum resident Dr Kamal Hossain urged people to be united saying, "Our victory is sure." He urged the people to guard polling stations on the election day to protect democracy as they are the owners of the country. "You're the owners of the country. You need to wake up to establish your ownership," he told the rally. Dr Kamal, an eminent jurist, mentioned that people are deprived of justice, as there is no rule of law. He, however said, the present situation of the country is an anarchic. He said, the government filed thousands of false case against opposition leaders and activists and confined them illegally, which is totally contradictory in sense of democracy. Raising question to the government, he said, it is what kind of farce that they are continuing dialogue in other hand and arresting the opposition activists and leaders in politically motivated cases on the other. Addressing in the rally, BNP Secretary General and also spokesman of Jatiya OikyafrontÂ Â Mirza Fakhrul Islam Alamgir said, "We along with people will establish people's right to vote and rule of law in the country." He hints countrywide rally and long march if the government does not dissolve the parliament and forms an election time none political government to hold free, fair and credible polls. Mirza Fakhrul said this while addressing the grant rally at Suhrawardy UdyanÂ as the chair of the rally. The Oikyafront leaders and activists will also march towards the Election Commission office in Agargaon area of Dhaka if any positive outcome does not come from today's (Wednesday) dialogue, Fakhrul said. Addressing as the main speaker of the rally, Oikyafront leader and Jatiya Samajtantrik Dal (JSD) President ASM Abdur Rab called upon the government to release BNP Chairperson Khaleda Zia immediately paving her way for joining in the next general election. On Monday, the alliance got conditional permission from the Dhaka Metropolitan Police to hold the public rally at Suhrawardy Udyan. As per the conditions, the rally concluded by 5:00pm. Krishak Sramik Janata League President Bangabir Abdul Kader Siddique, who joined the Oikya Front on Monday, said there is no alternative but to hold the next general election in a free, fair and inclusive manner. "And the prime minister would be forced to hold a free, fair and inclusive election," Kader Siddique, also a veteran freedom fighter, warned. Jatiya Oikya Front Leader and Nagorik Oikya Convener Manmudur Rahman Manna said, the last five years when they (Government) elected without vote, made the country as the haven of loot. They looted banks, all economical institutions. He said, they are trying to kill Khaleda Zia without treatment. BNP Standing Committee Member Khandoker Mosharref Hossain said, there is no chance to make drama in the name of dialogue. The result of deceptive would not be expected. Another BNP Standing Committee Member Goyeshwar Chandra Roy said that they want to take part in the upcoming general election in line of their seven-point demand. "There will be no election if our demands are not met," Goyeshwar said. Founder of Gonoshasthaya Kendra Dr Zafrullah Chowdhury said, the government is shouting development, development. The wave of development made a curtain on their eyes. They could not see the raising waves of the people. They could not hear the voice of the people. Dr. Zafruallah said, "today's Bangladesh, those who speak truth, certainly he or she will be thrown in jail. The best example is Barrister Mainul Hosein. He has been imprisoned illegally, because he criticised the government. The government imprisoned him with their ill motives." The case against Mainul is bail able, but the government detained him illegally. Dr Zafrullah also demanded Barrister Mainul's immediate release.